For training and remote maintenance we use the tool TeamViewerQS. On one hand, it allows us to access your computer remotely via the Internet and thus view the problem on site. On the other hand, we can also use it to release our screen for a presentation and thus demonstrate the functions of our software to you very easily. The right application for your operating system is automatically loaded there. 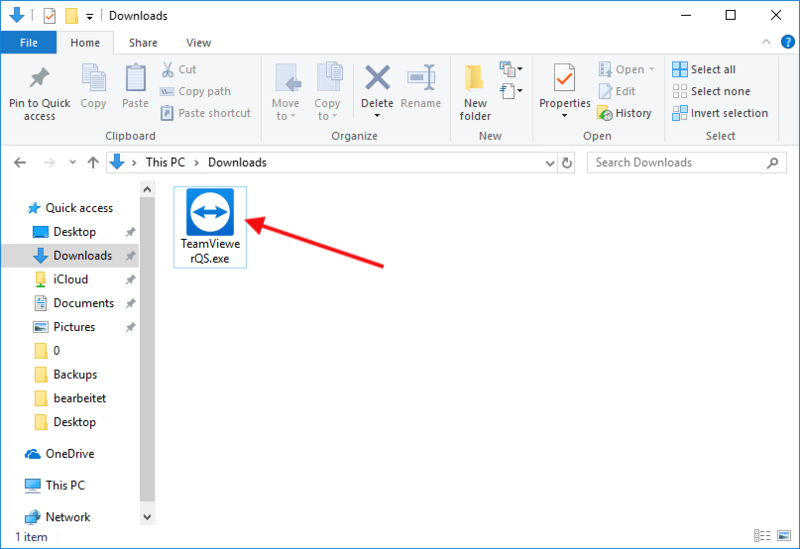 Downloading the program usually only takes a few minutes. 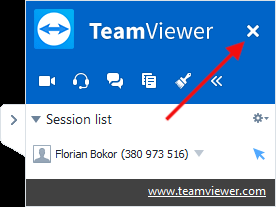 As soon as you have found TeamViewerQS (see screenshot), make sure that no other TeamViewer connection is active on your computer. Then start the program by double-click. If only one zip file can be found at first, extract it by double clicking on it as well. After opening TeamViewerQS you will see the window as shown on the picture. At the bottom of the window you can see the current status of the program. After a few seconds it should be set to "Ready to connect (secure connection)". Just be patient for a moment and we will get in touch with you immediately! A window will appear shortly informing you that one of our employees wants to see and control your desktop. Please click here on 'Allow'. When the session starts, you will see an information window with a connection overview on your screen. You can terminate the connection at any time by clicking on the small cross. TeamViewerQS is a screen sharing tool. This means that if we are connected we can see what is on your screen. It is best to close all windows and applications with sensitive data before you start a training or remote maintenance with us. It is possible via TeamViewerQS to take over mouse and keyboard at short notice. You can follow these movements on your screen and interrupt them at any time by moving the mouse yourself. A connection is only possible if the TeamViewerQS tool is open at both you and us and you explicitly grant us access. You must click on 'Allow' again each time you try to connect. It is therefore not possible for us to force screen sharing and, if necessary, to access your computer without your knowledge. If you close the tool during an existing connection, it is immediately interrupted. You can remove the tool from your computer at the end of the training or remote maintenance. 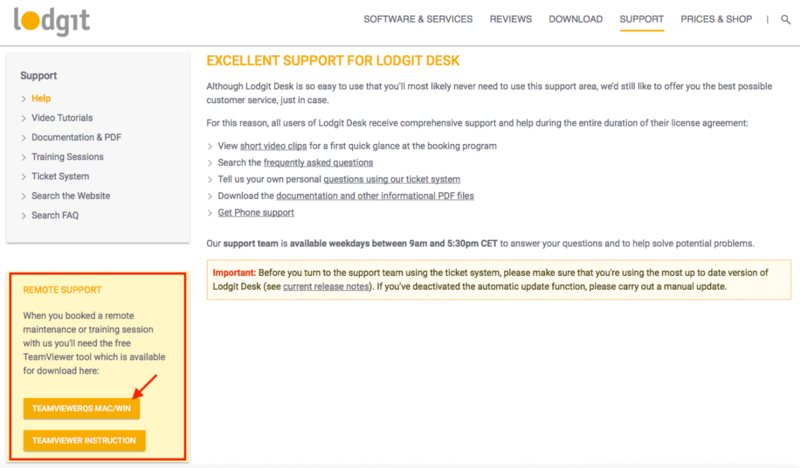 This has no influence on how Lodgit Desk works. 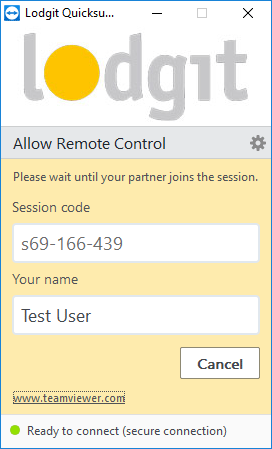 In case of a new remote maintenance or training you have to download the tool again.